Substitute camps may be used due to seasonal camp closures. Ensuring an unbelievable wildlife experience, our Lands of the Great Migration – Kenya & Tanzania safari travels by both land and air to the absolute best highlights of East Africa. A must for anyone who wants the widest experience of wildlife viewing in Africa. Enter a world of elegance, wild beauty, and the magical pages of living history on the plains of East Africa on our Lands of the Great Migration – Kenya & Tanzania safari. One of the world greatest natural wonders is the Great Migration of herds of wildebeest and zebra that travel the whole of the Serengeti-Mara ecosystem, from the north in Kenya’s Masai Mara, south across the great rivers, and into Tanzania’s great Serengeti plains. Annually, millions of the beasts follow thousands of years of instinct in their circular migration. And, where the herds go, as do the predators. Designed to give you the best chance to see the herds in action, this adventure extends to the best of what the region has to offer. Starting in Kenya, in the dramatic and unique Samburu Game Reserve, it continues to the world famous Masai Mara, home to the Maasai people and the big five game. Continuing your ‘flightseeing’ experience, see the densest concentration of wildlife in Africa at Ngorongoro Crater, and enjoy a true “Out of Africa” experience on the plains of the Serengeti. Wing north, where the colorful Samburu tribespeople, the rugged and dramatic terrain of volcanic mountains, gaunt hills, and the hardy desert rose provide a magnificent backdrop for your two days of game drives. Lion, buffalo, cheetah, the rare Grevy’s zebra, reticulated giraffe and more await. Fly south to Kenya’s most famous reserve. Two days of prime big five and possible migration game viewing in the diverse habitat that includes awe inducing sights of predators and prey in their eternal dance of life and death. Enjoy magical evenings under the stars, reliving the day’s adventures. 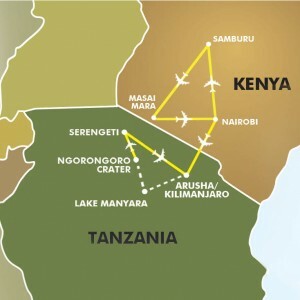 After a final Kenyan game drive, fly to Nairobi for you connecting flight to Tanzania. Tonight, enjoy some leisure time before your safari adventure continues tomorrow. Drive to fabulous Lake Manyara to spot flamingos, famed ‘tree climbing lions’, and more on your first day in the area. Continuing your exploration on your second day, descend into the largest intact volcanic caldera in the world and home to the densest concentration of wildlife in Africa. Fly to the vast Serengeti, your ultimate safari destination. Another home of the spectacular wildebeest migration, the grass plains are a perfect habitat for big cats and grazers alike. Two days of game viewing and watching the sun set on the western horizon. Bid “farewell” and your onward international flight. With fond memories – and photos – to last a lifetime!